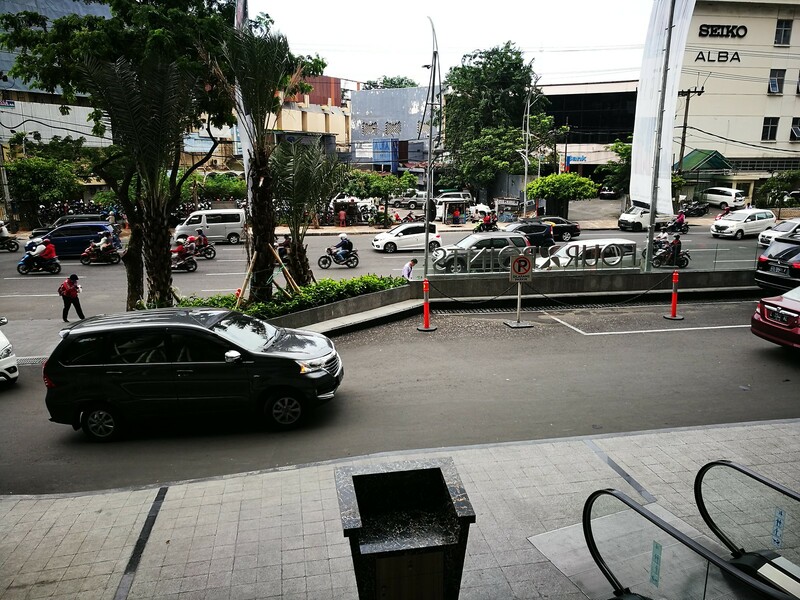 Surabaya is the second largest city in Indonesia making it one of the cities I frequently visit. Prior to this, my choice of hotel would be the Sheraton which gives me club lounge access. 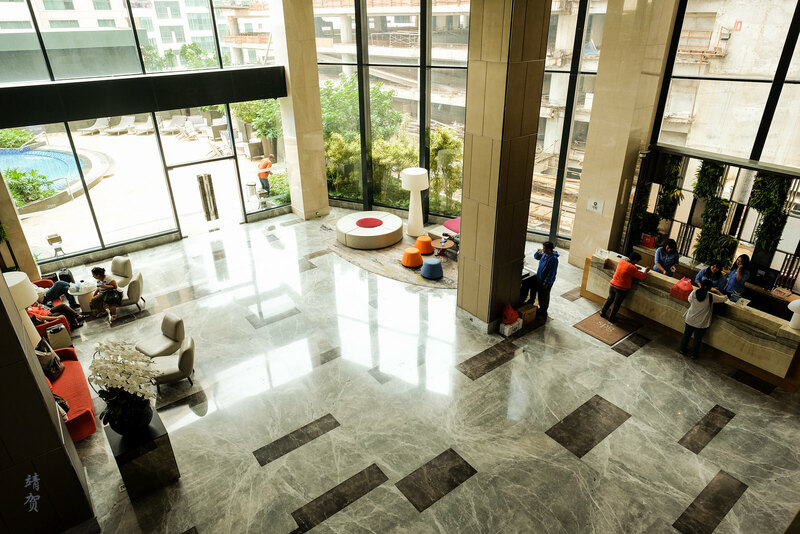 The same developer has now opened the Four Points by Sheraton connected to the same Tunjungan Plaza shopping mall. 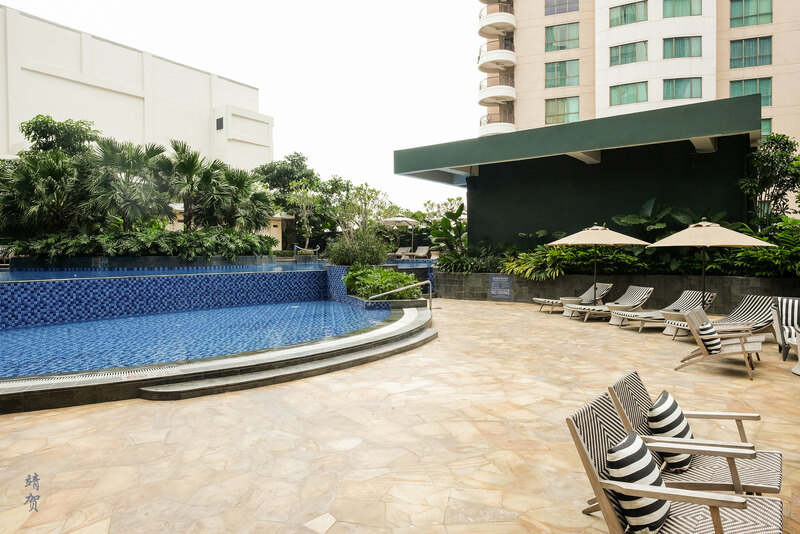 The location makes it convenient for out-of-town travellers since the mall has plenty of restaurants and is one of the largest shopping malls in the city. On arrival, there would be bell boys helping guests with luggage since to get to the main door guests need to go up the stairs or a short escalator. To go back down to street level, only the stairs may be used so visitors with disability might be inconvenienced. 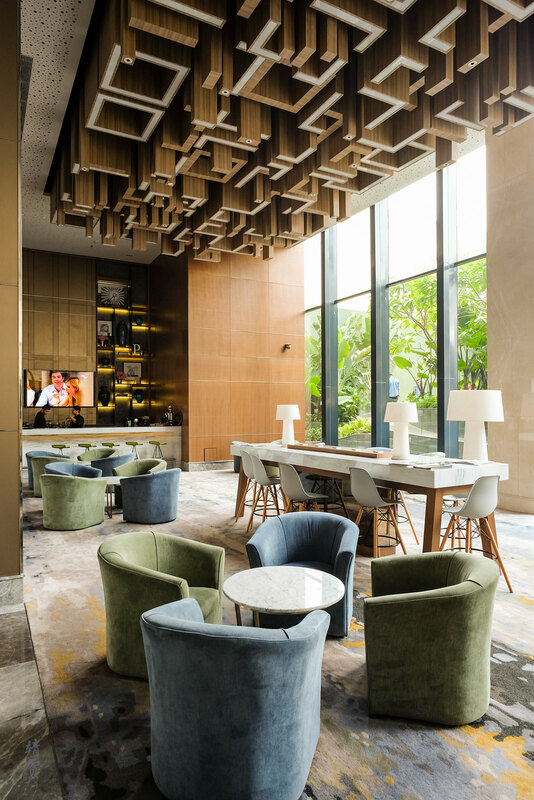 Four Points Surabaya has a welcome lobby with the concierge desk located on the ground floor with several armchairs and a seating lounge near the elevators. 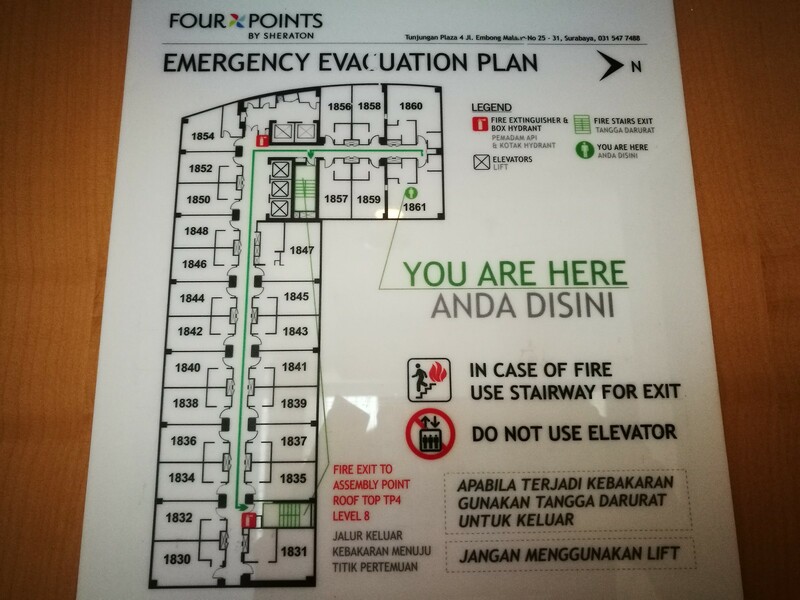 To check-in, guests have to take the elevators to the 8th floor since the floors between the ground and the lobby is used as car park space. 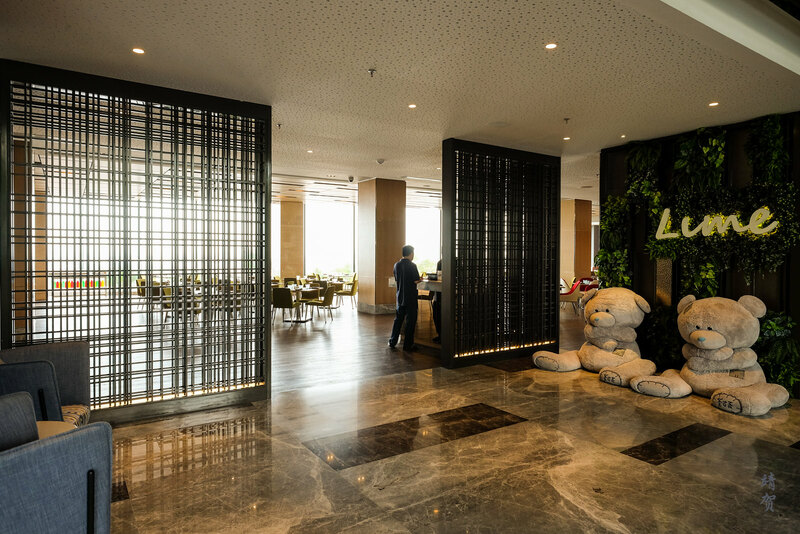 The main lobby itself is large and bright with floor to ceiling windows. Utilizing lots of light and greenery, the decor here is modern and contemporary at the same time. Design wise, it is close to the Four Points in Kuta, Bali. 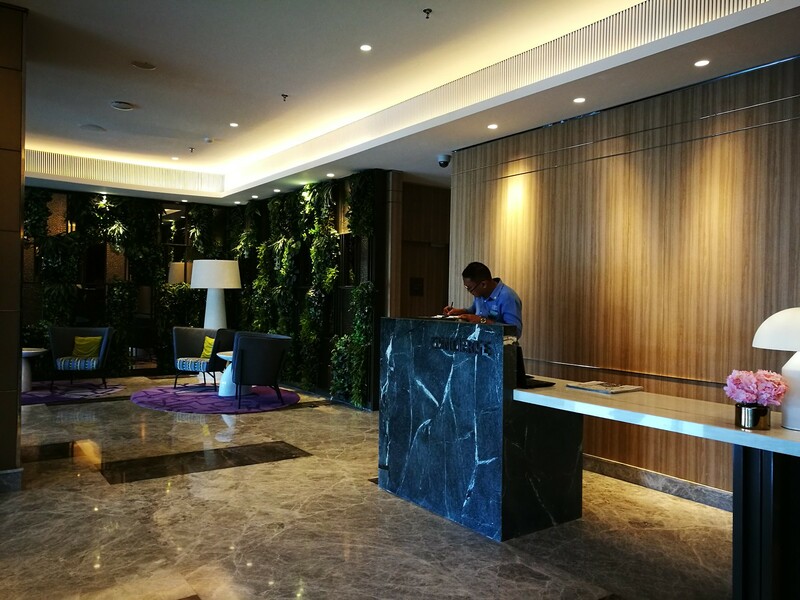 Reception here is quite small as compared to the Sheraton so there might sometimes be a wait to be checked in during busy periods. In my case, I had to wait for one other person before I was checked in. 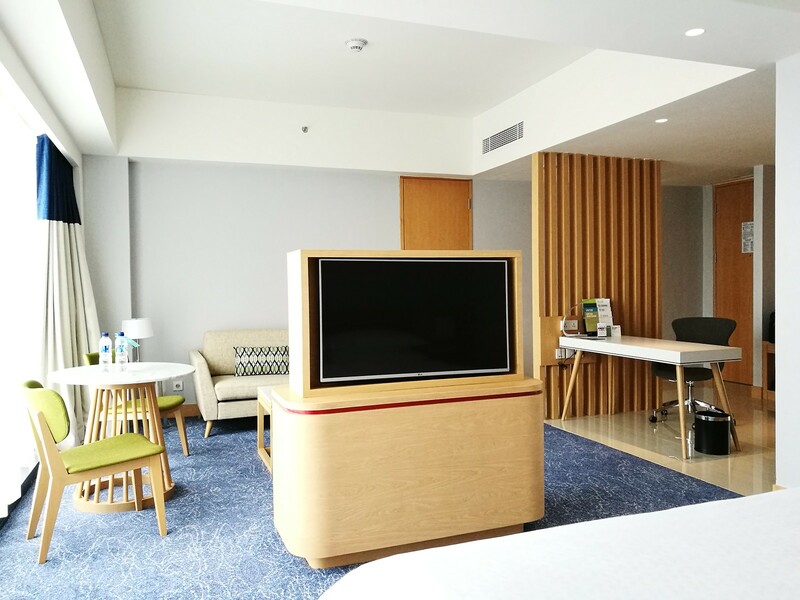 The staff here are able to communicate in English fluently and for a new hotel in a secondary city this was a good thing. The check-in process was fast and she asked me what time I would like to check out the next day, while noting my Platinum guest status and indicating my room has been upgraded. If there was a downside to staying here, I would say the elevators are a pain. 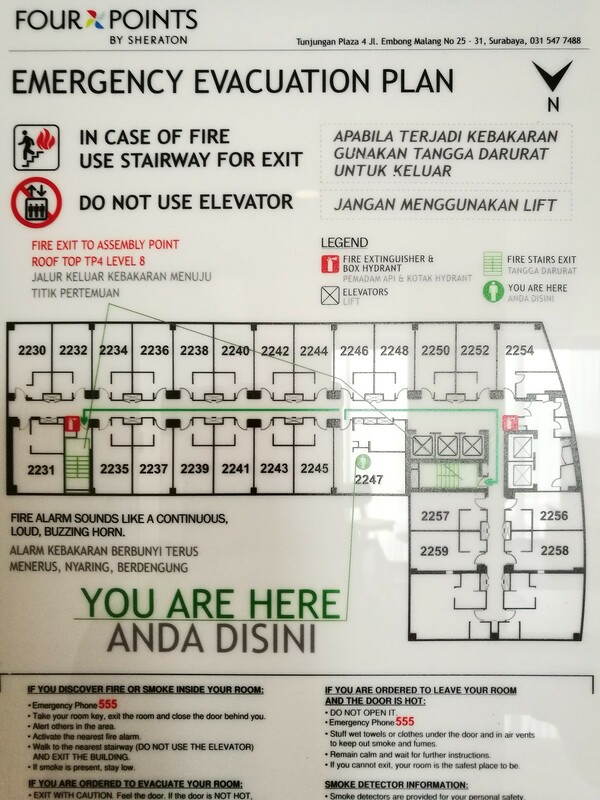 There was only 3 elevators serving the hotel and the need to stop at the 8th floor (Lobby level) most of the times for guests checking in/out makes it slow. Sometimes it could become a long wait for elevators here especially for my penchant for rooms in the higher floors. For this stay I was assigned to a suite in the 18th floor. On another separate stay I was given a suite with a different configuration on the 22nd floor which is the highest floor. I would compare both suites and mention which is my preference. As seen from the floor plan, there are up to 3 suites per floor and this is generous for a Four Points property. 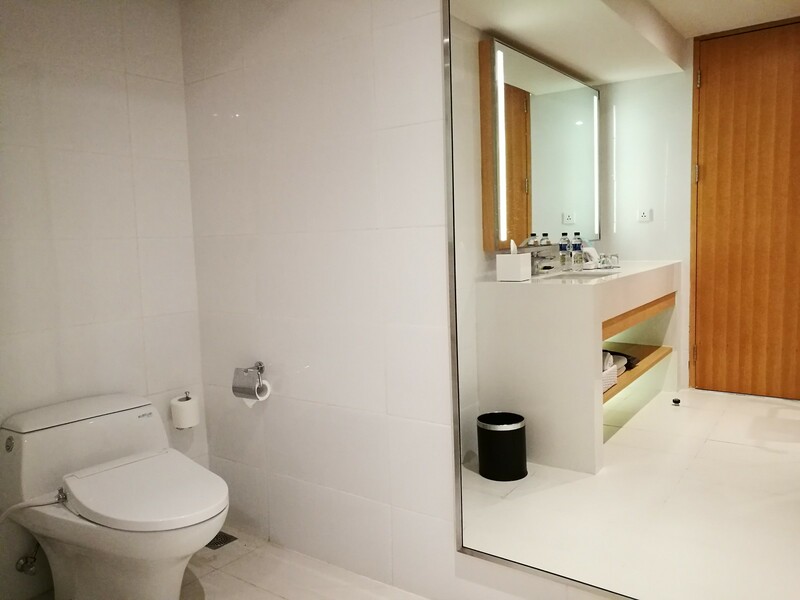 On entering the room, there is a powder room on the left with its own sink and toilet. Set by the corner of the wall closing the powder room, there is a work desk with an armchair. The work space is much smaller than what I am used to the Sheraton and if guests need a lot of working space, this suite might be a bit of a problem. The suites at the end are corner suites meaning they are bright and the living room takes up half of the space. It is furnished with a sofa, an armchair, side tables on each end of the sofa and a coffee table. A partition in the middle holds a flatscreen TV at both ends, thus they can watch TV from the sofa and the bed at the same time. A luggage stand was set up underneath the TV at both sides. 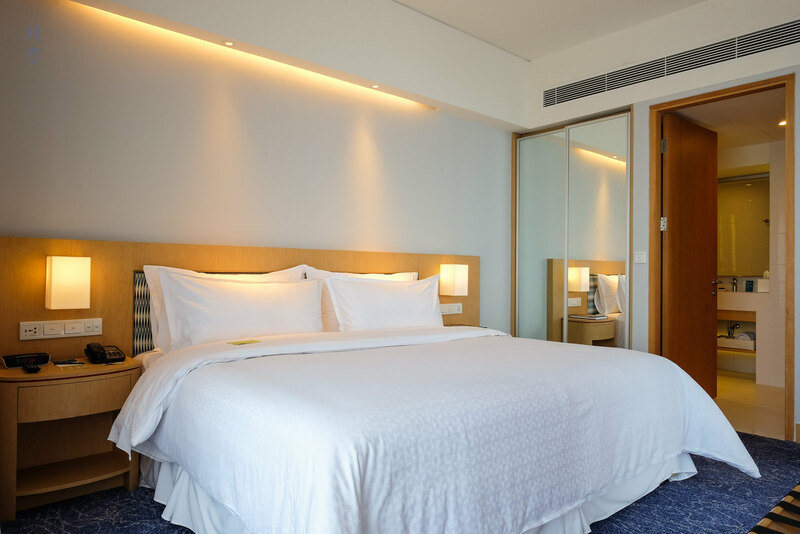 As for the bed itself, there is 2 bedside tables and a wardrobe with sliding glass doors that doubles as a mirror. The bed was a bit too soft for my liking and I feel it might not last the wear and tear, though this hotel was still relatively new at the time of my stay. 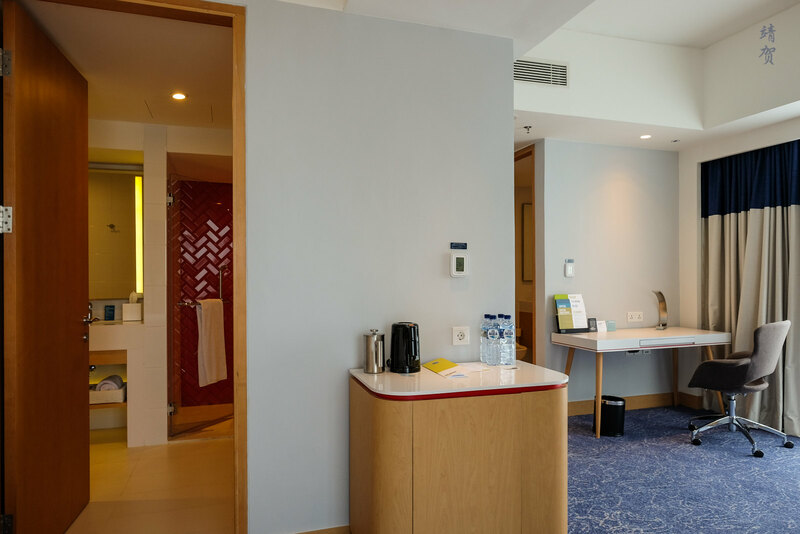 Beside the bathroom door, there is minibar cabinet with a French press to brew coffee and an electric kettle along with 4 bottles of mineral water. Indonesia does not have potable water from the tap, hence the ready supply of bottled water. More bottled water can be found by the sink in the bathroom. The bathroom itself was very large and has the toilet and countertop on the right. 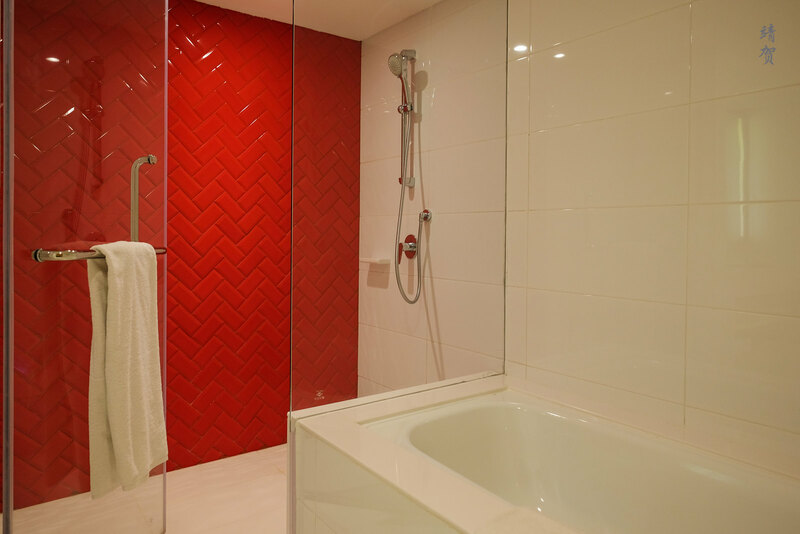 A large countertop makes it easy to place toiletries and the white tiles and design gives it a brighter look. 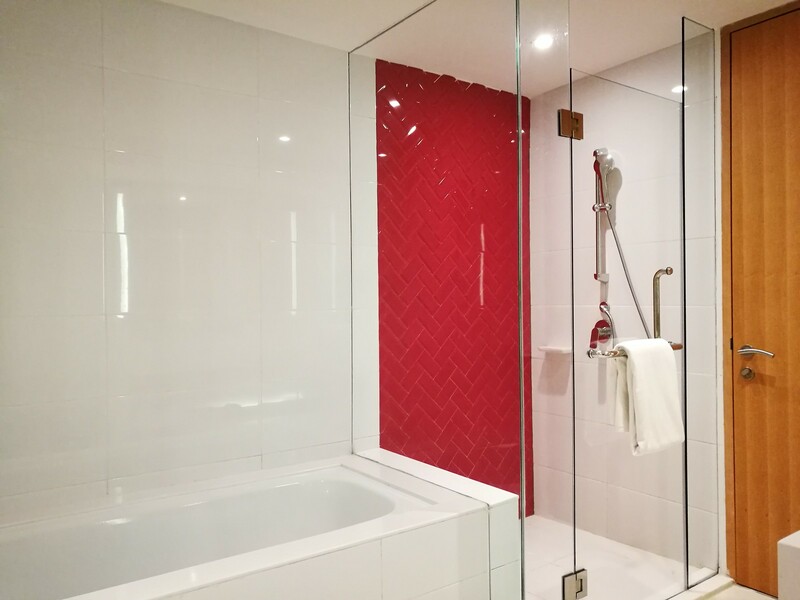 On the right side was a large bathtub with a separate glass enclosed shower stall. A premium bathroom it was and fitting for a suite even if the bathroom fittings were not the best one out there. 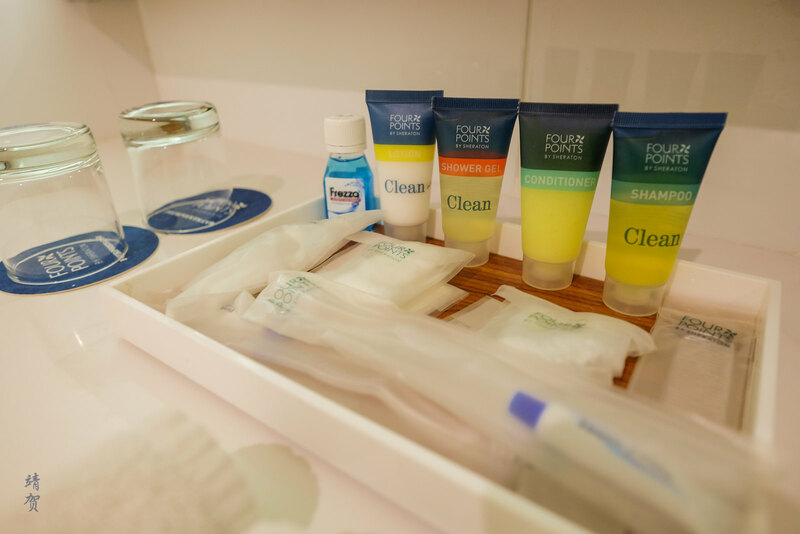 Amenities provided was also generous for a Four Points since there was the usual packaged shower cap, comb, dental and vanity kit in addition to individually packaged shampoo, bath gels and lotion. 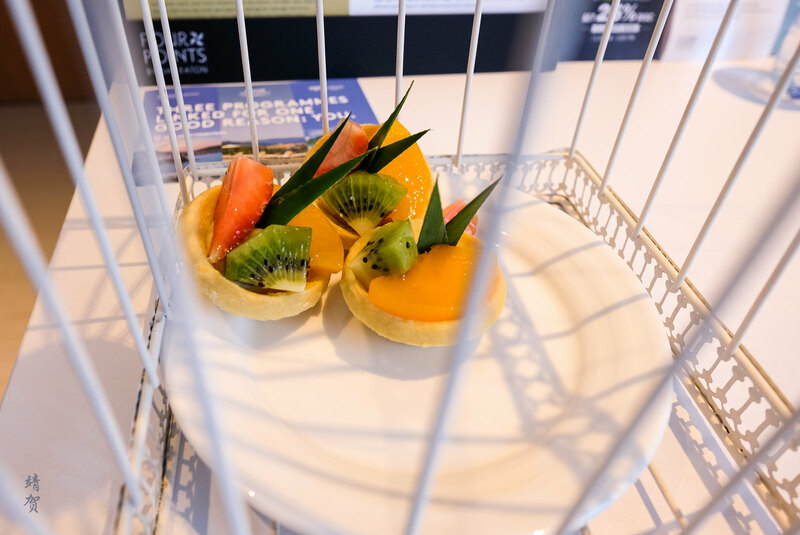 There was even a small bottle of mouth wash.
A welcome amenity of fruit tarts were sent by a room service staff after I checked in. This was sent with a welcome greeting card from the hotel for Platinum guests. On my second stay in the hotel, I had a similar check-in experience that was fast and efficient. And this time I was assigned to another suite but with a different layout on the 22nd floor. This suite is just right next to the elevators so it can be a bit noisier due to foot traffic. There was no powder room on entry. Instead a luggage bench and a closet is positioned on the left of the door. Across from it was a work desk with an armchair, and a partition with wooden slats by the desk. This suite has a much more open layout in the sense that only a low TV cabinet separates the sleeping area from the living room. The living room was furnished with a similar sofa but instead of the side tables being on both sides of the sofa, one was placed beside the window. 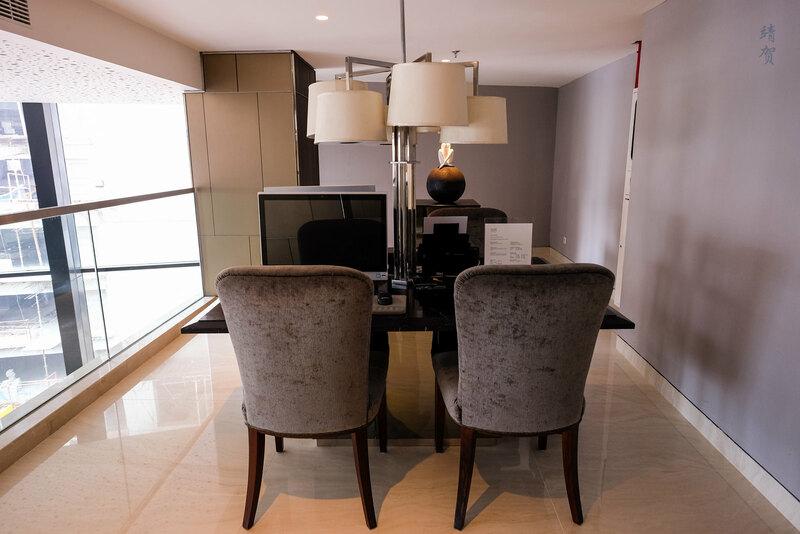 Two armchairs placed by the window creates more space for guests to sit around. 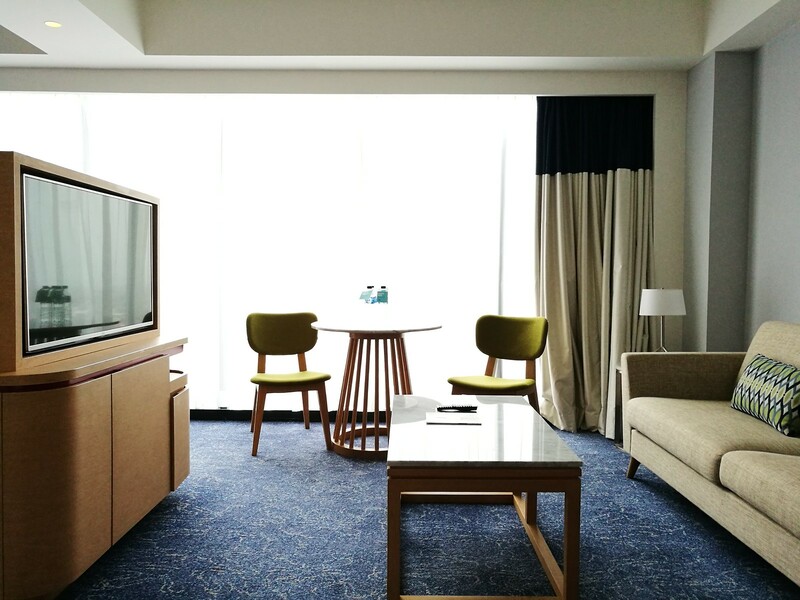 The open layout and full width windows makes this suite feels larger and brighter. 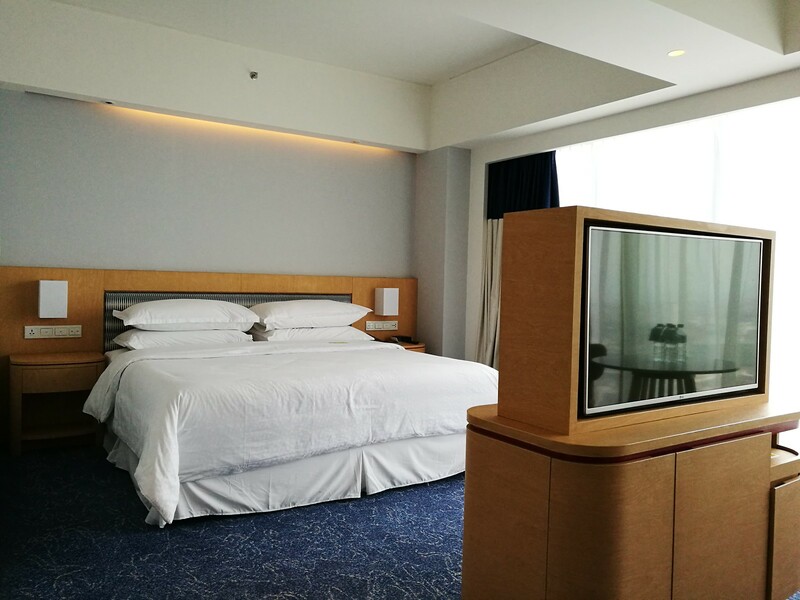 A similar king bed was placed at the other end of the room with its own TV facing the bed. 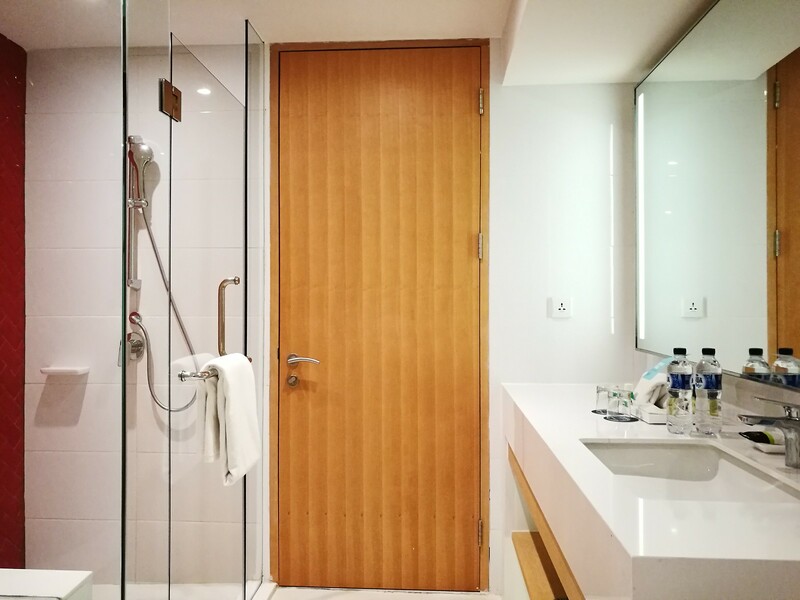 The bathroom features a different layout as well and the shower and bathtub was placed on the right of the door, with the shower stall being slightly smaller in size. 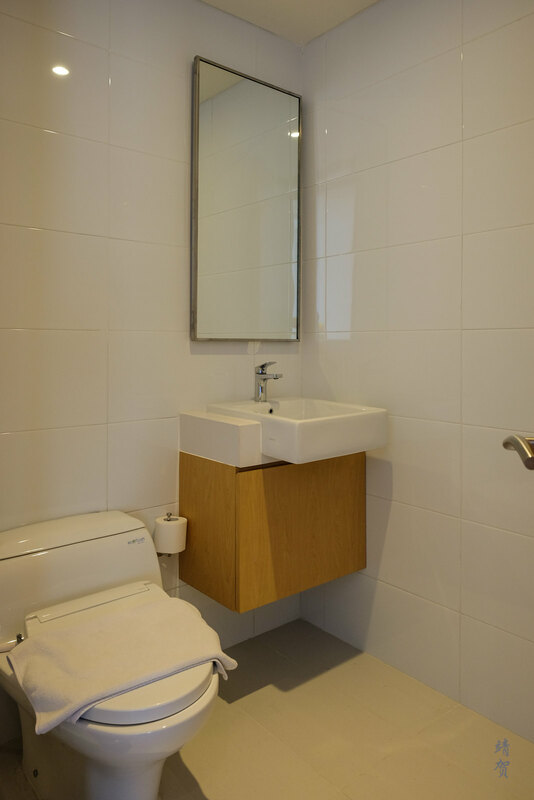 There was a similarly long countertop with still one sink but more than enough space for placement of toiletries. And at the end of the bathroom is the toilet providing it a bit more privacy. For the second stay, I had a slightly different welcome amenity of cookies, a small pudding and an apple. Between the 2 suites, I preferred the first layout with more separation of space and the powder room making it easier if I have guests over in the suites. However, I do not mind either suite as a complimentary upgrade since the amenities and furnishings are nearly similar. As a Four Points, there was no Club Lounge here and Platinum guests have to choose between the bonus points of breakfast for the amenity. Since I was on an early flight on both stays, I chose to take the points instead. For guests who choose breakfast, they can have it at the Lime Restaurant located on the lobby level. There is also a deli called ‘Wrapped’ that sells sandwiches, pastries and light bites beside the restaurant. 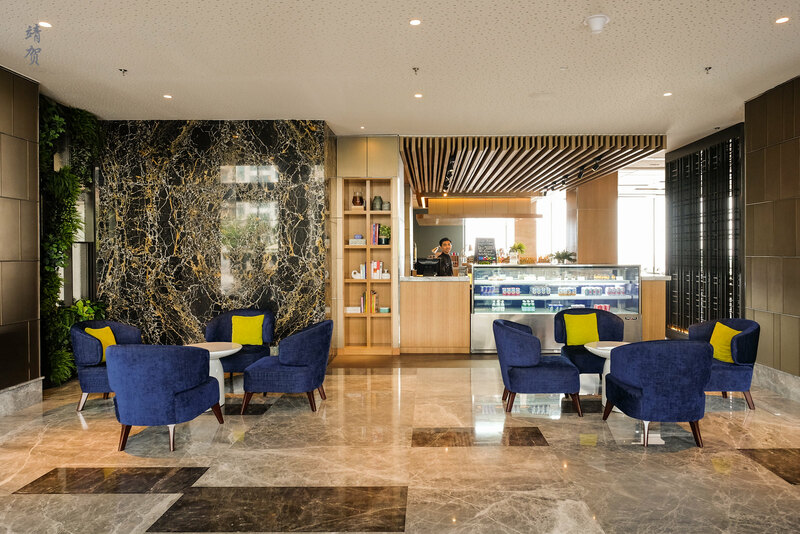 There is also a lobby lounge and bar with plenty of seats. The tall ceilings of the lounge makes it a nice place to hang out in the evenings. As I have mentioned, the pleasant furnishings gives it a very nice ambience as well. 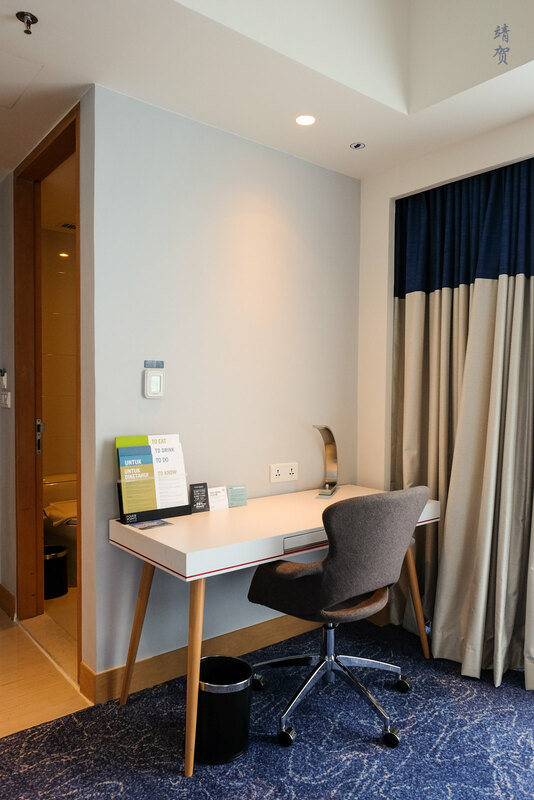 Located on the 9th floor, the hotel has a small business centre of sorts comprised of 2 workstations and a printer. There was a price list for the associated services including for printing and photocopying. 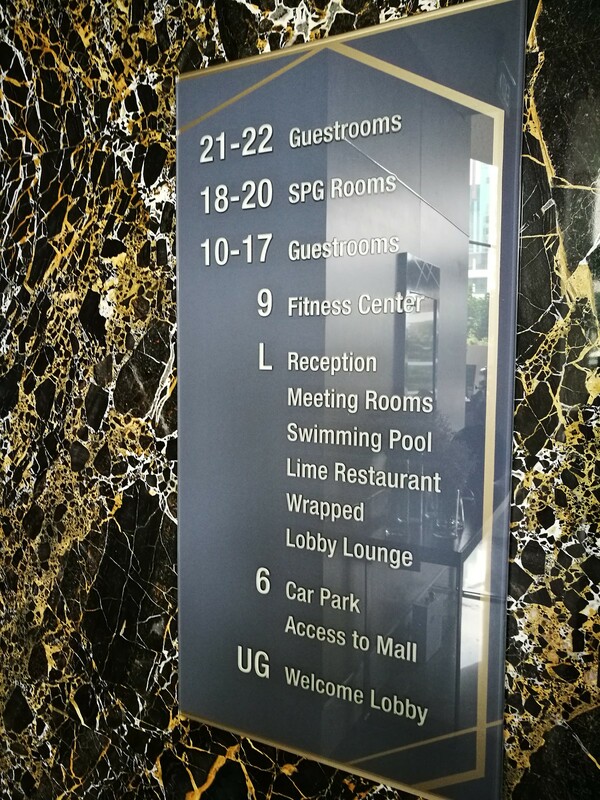 Walking along the 9th floor, guests would reach the fitness centre at the end of the hallway. 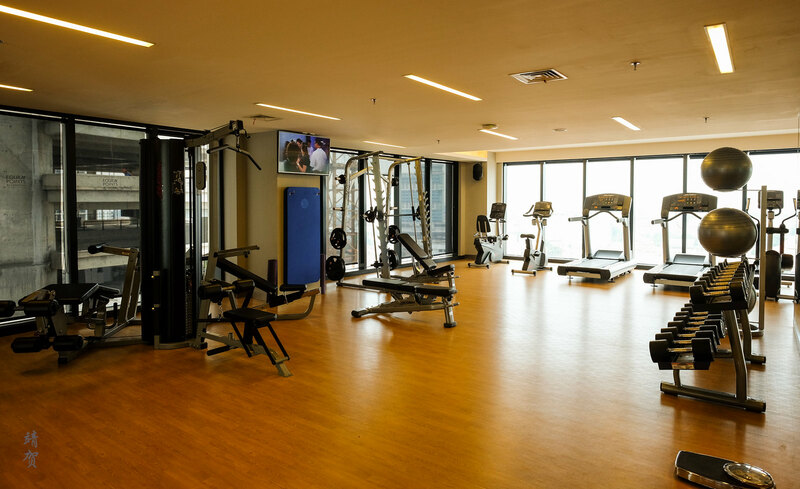 Equipments and space was impressive for a fitness centre with several fitness stations along with treadmills facing the window with a view. On top of that this area was nicely furnished with a resting area that has benches, towels, water dispenser, flatscreen TV and magazines. Definitely one of the best fitness centres in any Four Points I have been to. Finally the hotel has an outdoor deck accessed from the lobby. 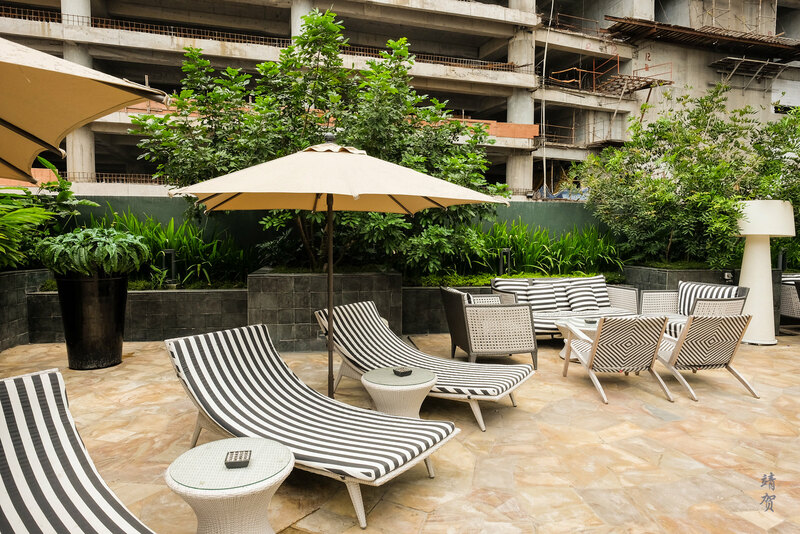 In addition to several garden sofas, there was deck chairs around a landscaped swimming pool. It was definitely a beautiful outdoor space. Unfortunately, there is still some ongoing construction works around the hotel that does make it unsuitable for use at the time of my visit. Perhaps that was why no one was using the pool when I visited. 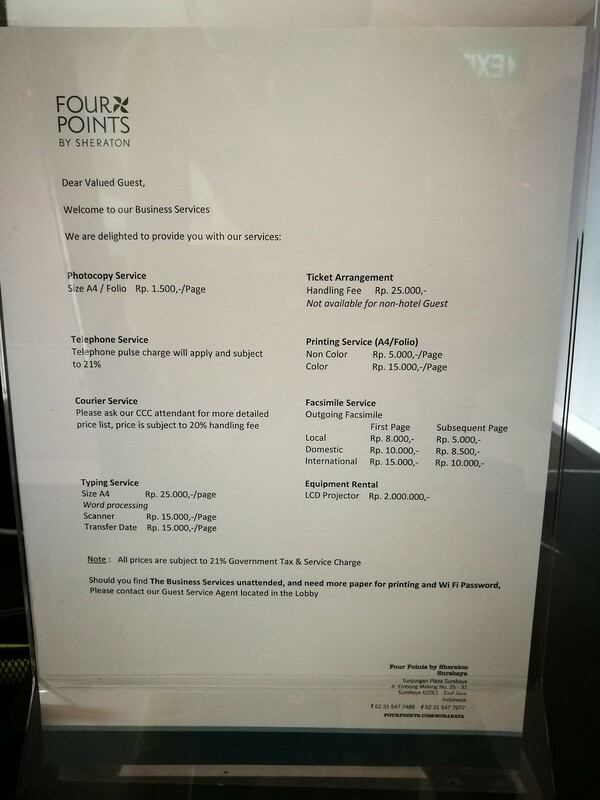 A one night stay here generally goes for around IDR900,000 with taxes (~$68), while the Sheraton in Surabaya was about IDR1.2 million (~$90). Since on both nights I have events to attend, I did not need a club lounge access, and had no plans for breakfast due to morning flights, I chose the Four Points on account of it being a new hotel. 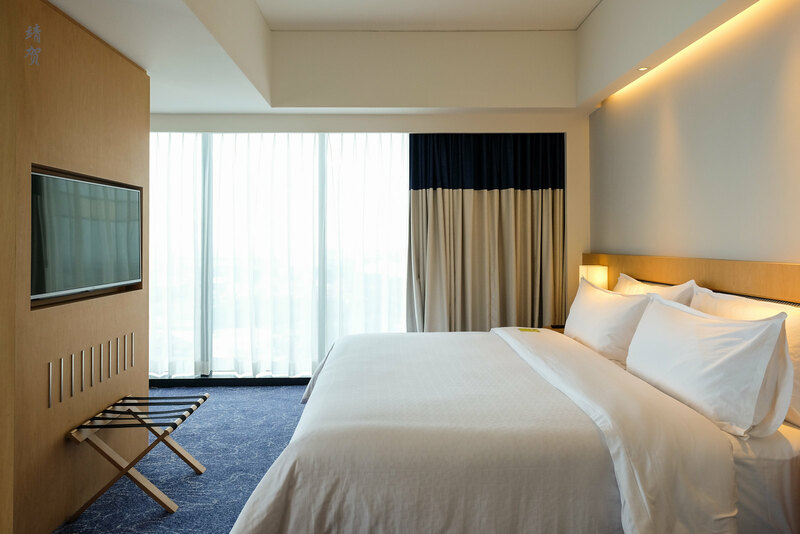 Comparing both, I prefer the contemporary finishing in the Four Points as the Sheraton in Surabaya is a somewhat old property. 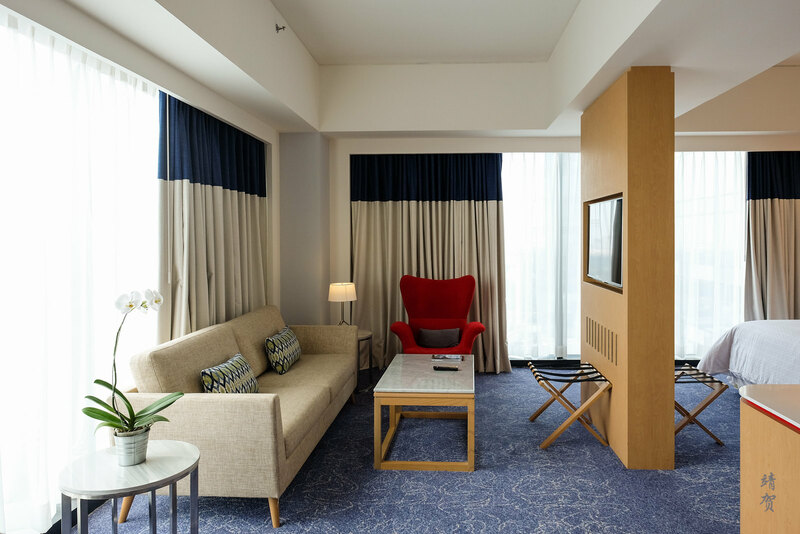 However in my future stays, I would definitely choose the Sheraton for the complimentary breakfast and club lounge access that I can get as a Platinum member for the small premium. Not to mention, Sheraton stays earn a 500 bonus points as opposed to 250 for Four Points stays.